Missile strikes against Syria delivered by the United States, Great Britain and France play into the hands of extremists and delay the perspectives of the peace settlement in the Arab repubolic, Russian Foreign Minister Sergey Lavrov said on Tuesday, TASS reports. "Such aggressive steps only aggravate the humanitarian situation, play into the hands of extremists and delay the perspectives for the peace settlement on the territory of long-suffering Syria," the top Russian diplomat said. Russia will persevere with ensuring respect for Syria’s sovereignty and territorial integrity, he added. "The escalation of the situation in Syria negatively affects the whole system of international relations. 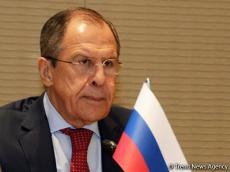 Russia will continue to strive for respect for the sovereignty and territorial integrity of Syria and all countries of this and other regions," Lavrov stressed.